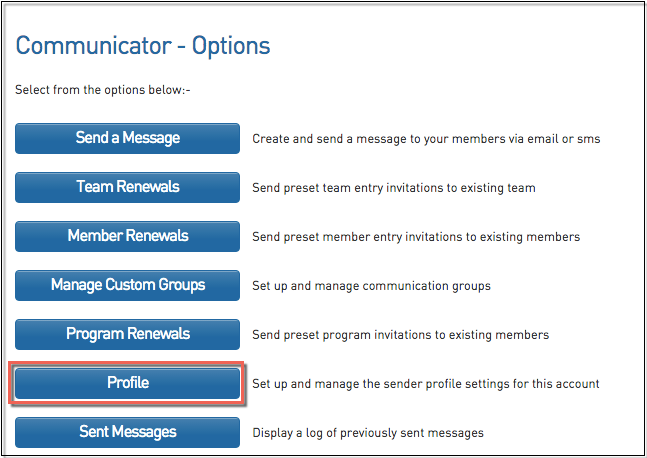 The Communicator profile settings is where preferences can be entered for email and SMS messages. You only need to enter information into the area that you intend to use, i.e. if you only intend to send emails, just complete the email settings; if you only intend to send SMS messages, just complete the SMS settings; or if you intend on using both methods, enter settings for both. 1. From the association, club or team 'dashboard', click on Communications in the menu. 2. The Communicator options will open. Click on Profile. 1. Enter the Reply To email address (compulsory). The Reply To address is the the email address that replies will be sent to. Email messages can not be sent successfully until a Reply To address has been entered. 2. Enter a default Email Footer/ Signature (optional) that will each new email will automatically be populated with. Setting up a default footer / signature will save you from having to set it up each time you compose an email. You can change or delete the default footer/signature when composing an email. 3. If you do not wish to enter any SMS settings for the time being, click on Save Settings. You are now ready to send an email message. 4. If you do want to set up your SMS preferences, continue on to the 'SMS Settings' area below. Before entering your SMS settings, you firstly need to create an SMS account and purchase credits - click here for instructions. Once an SMS account has been set up and credits have been purchased, follow the steps below to enter your SMS settings. 1. Enter the Reply To number (compulsory). This is the mobile number that recipients can contact if they need to reply to the SMS message. 2. Enter the SMS Username and SMS Password, as set up through your SMS Account. 4. Given that you have created an SMS account and purchased credits, you are now ready to send an SMS message.